Opium is an ancient substance, which dates back to 5000 BC. First of all, it is a powerful substance. You can derive it from the latex of the plant Lachryma papaverine. More commonly, you know it as Poppy. People have been collecting it since as early as 1500 BCE. Throughout history, people has called it many different names. For example, they can be“the joy plant,” “miracle drug” and “God’s own medicine.” So, why was opium so revered throughout the centuries? It was essentially the very first substance which changed one’s perception of pain. In other words, it was the very first painkiller. They allowed wounded soldiers, as well as tired workers, to toil for long periods of time. As a result, this made them more productive. There are some downsides of the drug use too. However, users did not know it back in the day. Seeing that, their focus was primarily on its benefits. They are the euphoric feeling (rush), anxiolytic and analgesic effects on the CNS. Of course, the lack of information about its use was extremely dangerous. This is due to its highly addictive, and therefore, lethal property. In fact, huge numbers of people became irreversibly addicted to this substance. It’s because the majority of people lacked adequate information about opium. Unfortunately, this led to countless untimely demises. As science and medicine progressed, it revealed more and more side effects. Thus, leading to a very cautious and limited use of the drug, at least in medical treatment. Today, experts know that it has four natural derivatives. They are morphine, papaverine, codeine, and thebaine. Likewise, synthetic versions of the drug include hydrocodone, oxycodone, and fentanyl. 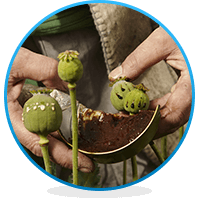 You get the drug from the sap of the unripe Poppy plant. As you cut its stem or slit open, white sap oozes out of it. Later, it turns yellow or brown as it dries on the plant’s surface. After it has completely dried, they scrape the bitter-tasting substance off. This contains various alkaloids such as morphine, codeine, thebaine, and papaverine. One acre of the plant harvested this way produces roughly three to five kilograms of raw drug form. After, you can sell it right away, or refine it further. Opium purification does not take arduous work or meticulous methods. Simple laboratories usually make use of an acid-based extraction. This way, they can refine the drug into morphine. A morphine base, which is a sticky, brown paste, is sun-dried after you press it into bricks. You can either smoke this form of it (even mixed with tobacco). Otherwise, it can go through various levels of purification to get heroin. You can make Vinum opii or Opium Wine by mixing sugar, white wine, cinnamon, and cloves. To make the syrup one has to combine 997.5 part sugar syrup with 2.5 parts opium extract. In this way, you can get opium extract (extractum opii) by saturating raw drug with water. During this process, you combine 20 parts water with 1 part raw opium. Finally, you just have to boil it for about 5 minutes. What are Some Synthetic Opium-based Medication? Let’s talk about Hydrocodone and Oxycodone. They make Hydrocodone from codeine. On the other hand, Oxy is a synthetic opioid. They derived it from the natural alkaloid found in the drug called thebaine. Ultimately, opium remains one of the most potent painkillers. It is a famous drug to pharmacists and doctors all over the world. No doubt, this is a powerful substance. However, one should be very cautious when on this drug. First, it is due to its very addictive properties. Second, using it can cause hardship to many people. They have fought wars over this stuff. Thankyou for the informative research; however I have been looking all over the internet and book stores for over a year now trying to figure out how to make smokable opium from a bunch of opium dried washed or unwashed batch of pods. Most people make a tea out of the pods. I would like to have the knowledge of just how one would go about using opium pods to make pure smokeable all natural opium. I know so far from research there is a way to do it,yet no body is telling. Would you please inform me of this knowledge? Thanks Stephanie Catherine Harrison.